Unlike the sweet, dark cherries that you find in the grocery store or at farmer's markets, tart cherries are sour, small, and bright red. You can find them in cherry pie fillings and sauces, but as their health benefits become better-known, they are increasingly available in juice concentrate or in capsules containing the powdered concentrate. 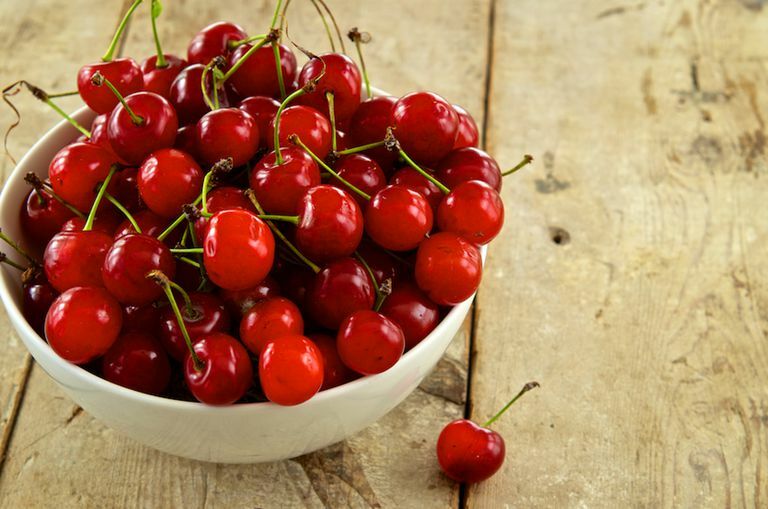 Although much of the research on the health effects of tart cherries has focused on a variety of sour cherry called Montmorency, there are other varieties of sour cherries such as Balaton cherries. Tart cherries have been reported to be a source of the sleep-regulating chemical melatonin, so some people take them to improve the quality of their sleep or to combat insomnia. Some people use tart cherries to promote muscle recovery after physical activity. Cherries are also said to be a remedy for gout. Are Tart Cherries More Effective Than Sweet Cherries? Tart cherries have been found to have higher levels of anthocyanins, vitamin C, and beta-carotene than sweet cherries. A half cup of sweet cherries contains 9.3 grams of sugar and 46 calories, compared to 6.6 grams of sugar and 39 calories in tart cherries (some tart cherries can have as much or more sugar than sweet cherries). There is no real evidence, however, that the differences are significant. Both types of cherries are high in anthocyanins compared to other foods. It may be that we hear more about the health benefits of tart cherries because of the way they are marketed. The U.S. Food and Drug Administration (FDA) has sent warning letters to cherry farmers and manufacturers for positioning tart cherries on their websites as a medicinal food that could possibly help with gout, arthritis, and diabetes. Some research suggests that anthocyanins may inhibit compounds (such as cyclooxygenase, or COX) that play a key role in the inflammatory process, however, few studies have examined whether eating cherries (or taking the concentrate) can relieve symptoms of arthritis, gout, or diabetes outside of the lab. Tart cherries could help ease muscle soreness and help you bounce back after a workout, suggests a 2015 study published in the Journal of the International Society of Sports Nutrition. In tests on 23 resistance-trained men, researchers found that study participants who took powdered tart cherry experienced a greater reduction in muscle soreness, strength loss during recovery, and markers of muscle damage, inflammation, and oxidative stress than those who took a placebo. Tart cherries are naturally rich in melatonin (a hormone involved in regulating sleep-wake cycles), according to a study published in the European Journal of Nutrition in 2012. For the study, 20 healthy people consumed either the juice concentrate of tart Montmorency cherries or a placebo for seven days. Total melatonin content (measured in urine) was elevated in those who consumed cherry juice, with significant increases in total sleep time, time in bed, and sleep efficiency. Small experimental studies suggest that cherry consumption can lower serum uric acid levels in people with gout, a painful inflammatory arthritis caused by the crystallization of uric acid within joints. A 2012 study published in Arthritis & Rheumatism analyzed 633 people with gout who had had a gout attack within the past 12 months. Cherry intake over the two-day period preceding a gout attack was associated with a 35 percent lower risk of recurrent gout attacks compared to no cherry consumption. Tart cherry juice may not help with osteoarthritis pain, according to a study published in Osteoarthritis and Cartilage in 2013. Researchers found that tart cherry juice relieved symptoms for people with mild to moderate osteoarthritis of the knee, but the effect wasn't greater than that of a placebo. Walking time and acetominophen use also weren't affected by treatment with tart cherry juice. Cherries contain sorbitol, a type of sugar alcohol that can cause bloating, stomach upset, gas, and diarrhea or exacerbate symptoms in people with conditions like irritable bowel syndrome (IBS) or fructose malabsorption. Tart cherry consumption was found to temporarily lower systolic blood pressure (the top number in a blood pressure reading). In a case report, daily consumption of a cherry concentrate was associated with acute kidney injury and high potassium levels in a person with underlying chronic kidney disease. Supplements haven't been tested for safety and are largely unregulated. Also keep in mind that the safety of supplements in pregnant women, nursing mothers, children, and those with medical conditions or who are taking medications (such as blood thinners) has not been established. You can get tips on using supplements, but keep in mind that self-treating a condition and avoiding or delaying standard care may have serious consequences. Tart cherry juice and juice concentrate and fresh, frozen or dried tart cherries can be found in grocery stores, health food stores, and online. They are also available in capsule form from supplement stores and online. Drinking tart cherry juice or eating tart cherries may boost your anthocyanin intake and antioxidant status. While the studies on the health benefits are promising, there isn't enough evidence to recommend tart cherries or cherry juice as a treatment for any condition, including pain, gout, or insomnia. If you're still considering adding tart cherry juice to your diet, be sure to talk with your healthcare provider to discuss whether it's appropriate for you. Levers K, Dalton R, Galvan E, et al. Effects of powdered Montmorency tart cherry supplementation on an acute bout of intense lower body strength exercise in resistance trained males. J Int Soc Sports Nutr. 2015 Nov 16;12:41. Schumacher HR, Pullman-Mooar S, Gupta SR, Dinnella JE, Kim R, McHugh MP. Randomized double-blind crossover study of the efficacy of a tart cherry juice blend in treatment of osteoarthritis (OA) of the knee. Osteoarthritis Cartilage. 2013 Aug;21(8):1035-41. Zhang Y, Neogi T, Chen C, Chaisson C, Hunter DJ, Choi HK. Cherry consumption and decreased risk of recurrent gout attacks. Arthritis Rheum. 2012 Dec;64(12):4004-11.